Here is my round card for yesterday's Mojo Monday. I will probably try the square version sometime this week as well. 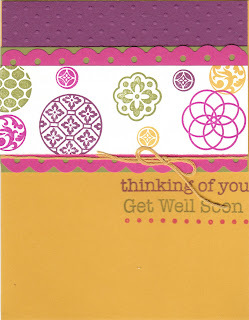 I am making sympathy cards for my card sets for the craft fair. I used Ruby Red, Soft Suede, Mustard and Olive for my colors. The image in the center is from a retired SU set called "Serene Spring" I stamped it in Soft Suede ink and then used my blender pens with chalks and pencils to color it in. 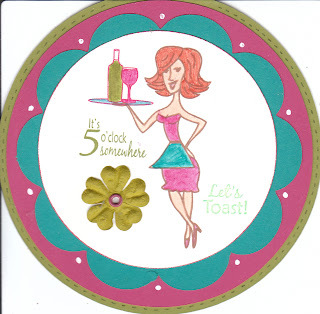 I used my SCAL software and Kwerner Card shapes Digital Cutting kit for all the circles. The sentiment at the bottom is from Hero Arts "Everyday Sayings" and I stamped it in Suede ink. 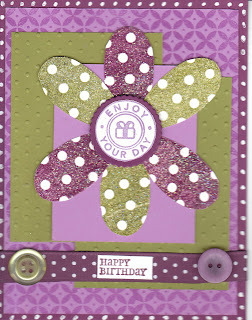 I added the ribbon along the center and finished the card with the prima flower. That's all for me today. If you missed my post yesterday, check it out here. I posted 5 cards and would love to know what you think! Have a great evening, see you soon!! Well, I know I haven't posted in a few days. I have been busy with family in town this weekend and Reagan had her tonsils taken out on Friday. I have had a chance to do some crafting during down time however, and once again I have a whole slew of cards to share with you. 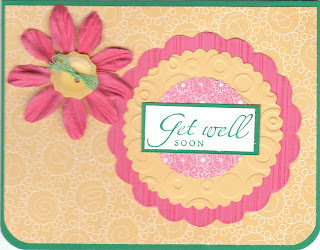 These are baby girl cards and get well cards for the cards sets I'm doing for the craft fair. Rather than trying to wrap the text all around them, I'm just going to post them all at the bottom of this post. I did manage to do a couple of challenges as well. The first one is for the OCLDT 06 challenge using the set "Garden Thoughts", and the second is for this week's Get Sketchy challenge. The rest are simple and straightforward, and I have to get the little guy ready for pre-school. Have a great day and I'll be back again in a couple of days with some more things to share. 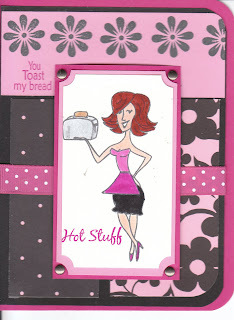 Here today with my cards for yesterday's Tuesday Morning Sketch and today's SCS sketch challenge as well as this week's color challenge. 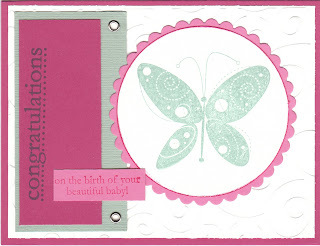 I am working on baby cards this week for the gift card sets I am doing for the craft fair. The first card is for the TM sketch. 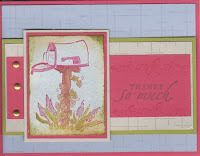 I used Chocolate Chip, Bashful Blue, Certainly Celery and some textured card stock from Bazzill earth tones collection. 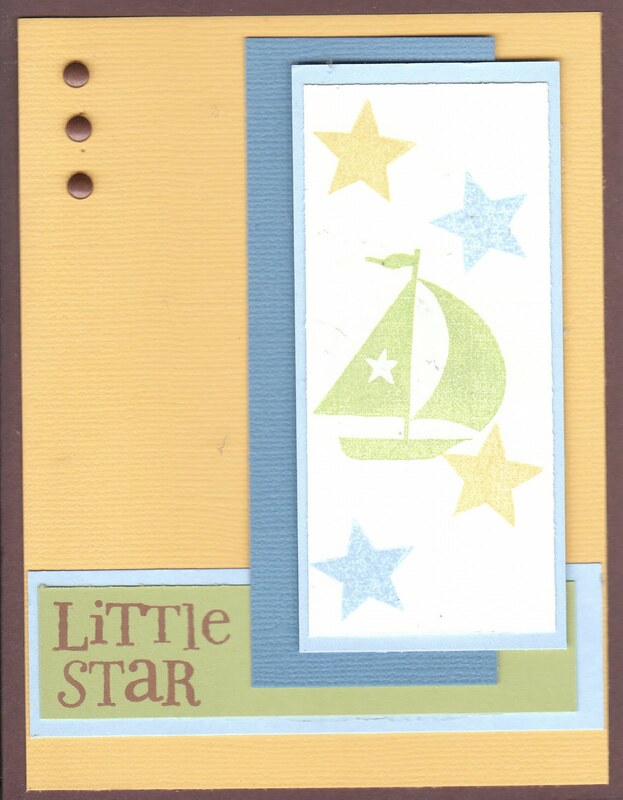 I also used a new stamp set from Inkadinkado appropriately titled "Baby Boy" As you can see, I stamped the images in softer ink colors (bashful blue, saffron and celery) so they are a bit hard to see in the picture. 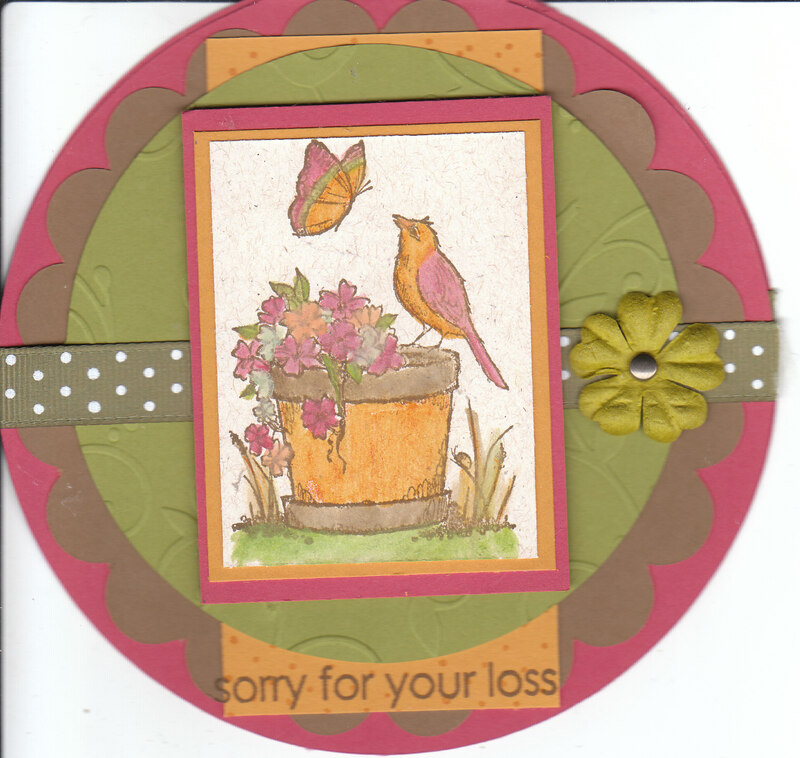 This was a simple sketch to work with and an easy card to put together. So, that's the boy card for today. Now on to the girl card. This is for today's SCS sketch challenge and the color challenge to use Dusty Durango, Pretty in Pink and Creamy Caramel along with a neutral. I chose white. I really like this combo especially the Pink and the Durango. This was by far the easiest card I've put together in a long time. It took m e less than 30 minutes and I have to say I completely love the results. The flowers are from a tin of Prima flowers that I have and the button is from SU. I really like to use these flowers; but they are quite large and so sometimes you have to design the card around the flower instead of just adding them as a last minute embellishment to the card. 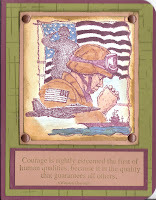 It's a bit hard to see in the photo, but I did use a cuttlebug embossing folder on the white background piece. I really like the look of the white embossing! 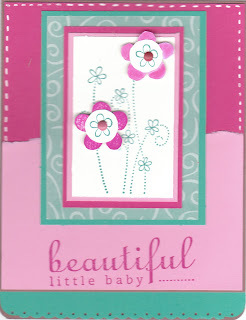 The "Sweet Little Baby" sentiment, stamped in Regal Rose ink, is from the Inkadinkado set called (yep...you guessed it!) "Baby Girl"
Ok, so that's it for me today. I will try to post again sometime Friday afternoon. Until then, have a great couple of days and happy crafting!! about them, so I'm just going to put up the pictures and leave you to decipher them for yourself. 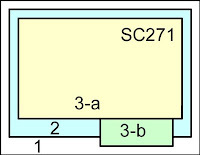 It really shouldn't be that hard, because let's face it, I don't really do anything too complicated! I apologize for the somewhat random and weird placing of the photos in this post. I should have probably done them as a slide show; but I couldn't figure out how to do that, so unfortunately I had to just put them where I could fit them. I will also tell you that I probably won't be blogging much this week; but don't worry....I'll definitely be crafting!! Anyhow, I hope you like my latest creations. I'll see you all in a few days. Have a great evening! Well, I sure hope the rest of my day turns out better than my morning. Long story; but let's just say I really wish I could have hit the rewind button and started over! Oh well, nothing to do; but move forward right? 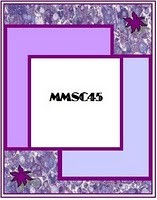 So here is my card for yesterday's MMSC challenge and SCS color challenge using Rich Razzleberry, Orchid Opulence and Old Olive. I rather liked this color combination and could definitely see myself using it again! I used Martha Stewart Pattern background stamps on the Orchid Opulence piece which I embossed with Versa mark and clear embossing powder. Next, I ran the two Old Olive pieces through my CB with the Swiss Dots Embossing Folder. The flower in the middle is from SU's Pick a Petal. I stamped 3 petals in Rich Razzleberry and 3 in Old Olive and then embossed each one with Iridescent Ice embossing powder, to give it that sparkle (that hopefully you can see!) I added the sentiment in the middle which is from a retired SU set called "Riveting" I used Rich Razzleberry ribbon at the bottom and added the two buttons with the "Happy Birthday" in the middle. 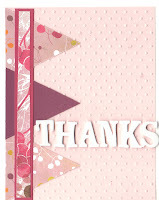 Finally, I finished the card with some white dots around the card. A lot going on in this card; but I hope you all like it. Have a great day!! Wow what a morning! I overslept until 7:10 this morning, which does not help when Reagan's bus comes at 7:15. I guess that's what I get for taking NyQuil on a Sunday night huh? Good thing DH was able to drive her to school. I stamped Betty and the toaster she's holding with Color Box Charcoal Chalk ink, which has become my new "go to" ink pad. I colored Betty and the toaster with Copic markers, SU markers, ink pads and blender pens. Anyhow nothing fancy; but still cute I think. Have a great day. I've decided to treat myself to a coffee at B&N this morning while Jonathan's at school. See ya soon! is for yesterday's SCS sketch challenge. 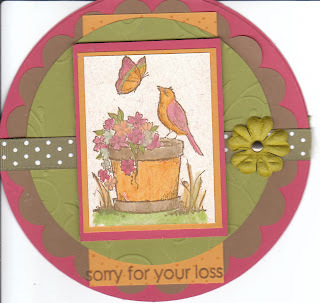 I decided to use some of my Basic Grey "Indian Summer" papers. 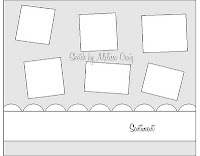 I had originally been saving a lot of these sheets because I thought they might make really nice backgrounds for some scrapbook layouts using some black and white photos. That just hasn't worked out...so why not use them right? Besides, there should be enough left over for me to maybe make a mini album of some sort. I paired the paper with Chocolate Chip, Dusty Durango and a sheet of Purely Pomegranate that I found quite by accident and was thrilled! 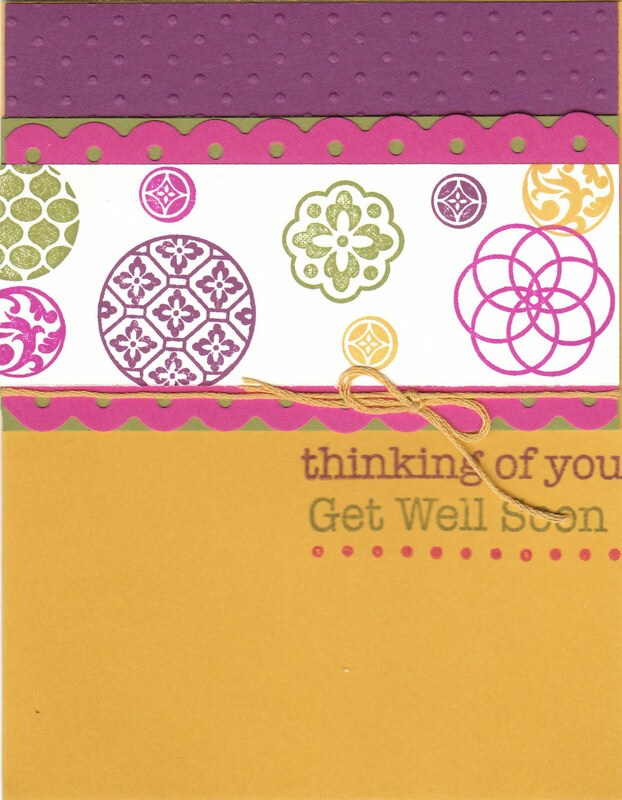 I really liked the colors and designs in this set of paper and wanted it to be the focus of the card rather than a stamped image. 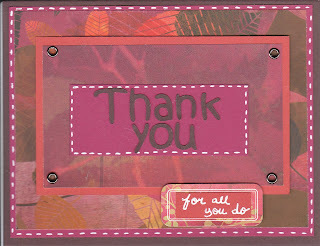 So, the "Thank You" letters were cut with my cricut using one of the fonts in the "SCAL" software. I wrote the "for all you do" with my white gel pen and then added the eyelets and the other white stitching lines to finish the card. Anyhow, a simple card but I was pleased with the results. I hope you like it too. Leave me some love if you can, you know I enjoy all your comments. Have a great day! Today I have one card for two challenges: Yesterday's Tuesday Sketch Challenge and today's Color Throwdown using Melon Mambo, Bermuda Bay, Wild Wasabi and Marigold Morning. I actually don't have anymore Wild Wasabi or Marigold Morning, so I substituted some colors from my stash that I thought were a close enough match. 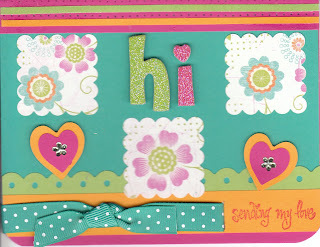 The scalloped squares of pattern paper are from the Sasha Paper Collection by Prima and the "hi" letters are chipboard from Me and My Big Ideas. All in all a simple card; but I think it came together well. I hope you like it. Thanks so much for stopping by. Leave a comment if you can, I'd love to hear what you think. Today I have my card for yesterday's Mojo Monday. I'm going to keep the nitty gritty to a minimum, however. Hubs is working on a test today, so he is gone all day which means I have the potential to do 1 or 2 more cards...Yippee!! However, I do need to at least attempt to a couple of domestic things as well. 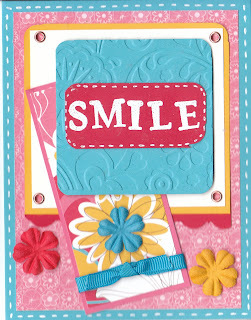 Not a lot of stamping on this card except for the letter stamps for the "Smile" sentiment in the middle which I stamped in Versamark and then embossed with white powder. The rest is all straightforward. I'm going to visit a few of the other mojo participants and then I'm off to do a bit of laundry and tidy the bedrooms and kitchen before moving on to my next project. Wow! What a busy and wonderful weekend I had. I took Reagan to the Tyson American Cup Gymnastics competition on Saturday and then yesterday we spent time playing at the park, I got some house cleaning done and had time to stamp! 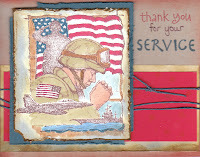 I have two cards to share here with you and then another one in my SCS gallery. This first one that I have is for Saturday's OCC challenge. I haven't had an opportunity to play with the OCC in a while and the sketch appealed to me, so I thought I'd give it a shot. I actually didn't do any stamping on this card. I wanted to use my Cricut with my Spring Flowers (by Kristina Werner) digital cutting ki t from Two Peas for the flower in the middle. I used Saffron, Bashful Blue, Pumpkin Pie, and a sheet of SU paper from their "Washington Apple" collection. I also used my very last scrap of Riding Hood Red. I rolled the ends of the flower up so that it has a bit of a more realistic and 3D affect. I took a close up picture of that part of the flower, so that you could see the dimensions of it. 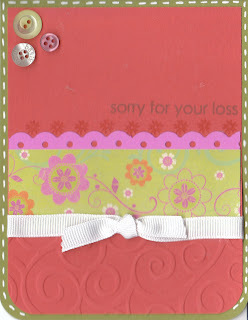 I decided also to leave off the sentiment and will put it on the inside when I do that part of the card. 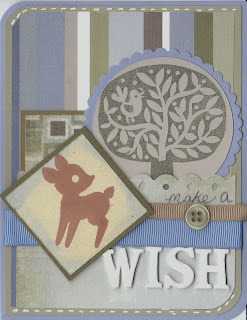 The next card I have to share today is for Friday's OCL DT 03 challenge. I have been having so much fun with my new OCL sets; but I decided to break out a different set for this challenge. This set, "Garden Thoughts" was one of the first OCL sets I got and I still love it! 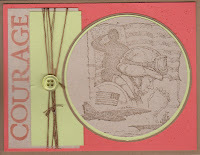 I combined this challenge with the colors from last week's Color Throwdown to use Ruby Red, Old Olive and Not Quite Navy. The striped olive paper is from a sheet of SU paper from their retired "Tea Party" set (I think that's the name of it!) 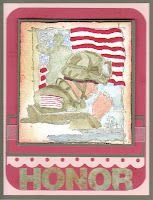 I used a Martha Stewart background stamp which I embossed with Versa Mark and clear embossing powder on the Ruby Red piece. 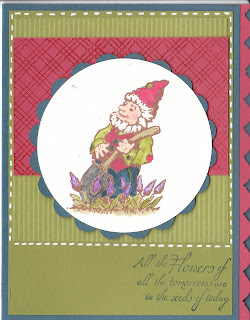 I stamped the garden gnome in Chestnut Roan ink and then used Copic Markers, SU markers and water color pencils with blender pens to color him in. Ok, so that's all for me today. Thanks for stopping by. Have a great day!! I am completely in love with the new OCL stamps that I've gotten. You've already seen Hot Betty (and there's more of her to come...) and today I have one from the new set "Hippity Hoppity" This card is very simple and trust me doesn't even begin to break the ice of possibilities with this set. Every year I make cards for two holidays: Christmas and Easter. 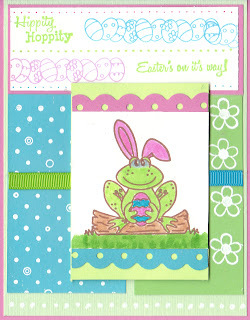 I don't make nearly as many Easter cards as I do Christmas ones. I usually only have to make about 10 for family and close friends. This means that I don't have to mass produce 3 or 4 designs like I do Christmas cards. Ok, so here we are with my first Easter card of the season. 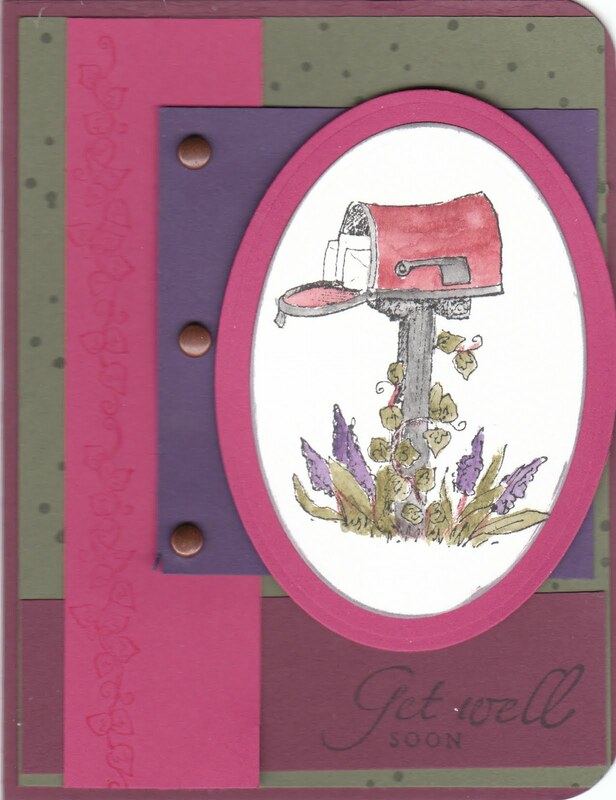 I used Brocade Blue, Orchid Opulence, Certainly Celery and Pixie Pink. I used my "Blooms and Dots" embossing folders on the top half of the Orchid Opulence piece. 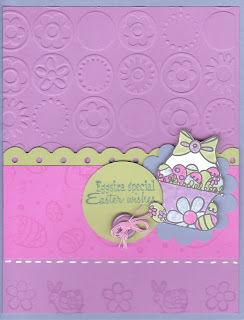 I used my SU "Egg Hunt" wheel with versa mark along the Pixie Pink strip. I punched the edge of the Certainly Celery piece with my Fiskars Threading Water Punch. I colored the basket with eggs using SU markers and a Brocade Blue watercolor crayon. 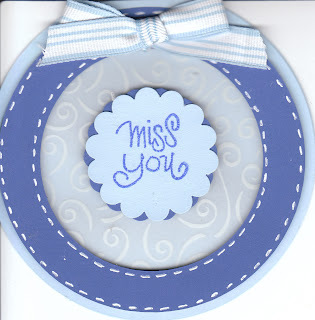 I added the button with the thread and the faux white stitching to finish the card. It is with heavy heart that I post my card today. 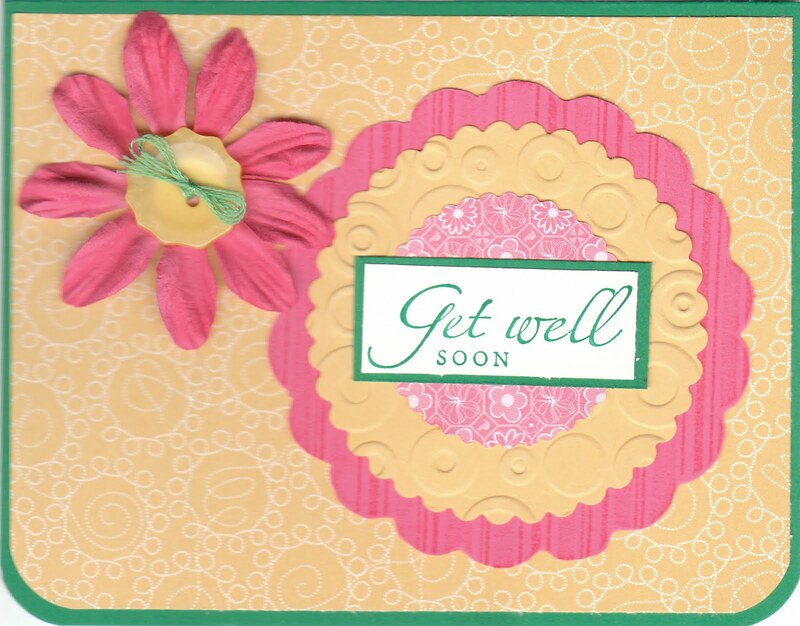 As you can see I am posting a sympathy card that I will be sending to my cousin whose daughter was killed in a car accident on Sunday. She was only 27 years old and leaves behind three small boys ages 7, 5 and 6 months old. I had not seen Daisy in many years, and to me she will always remain a cute little 5 year old with pigtails and blue eyes splashing around in the pool in the backyard. As a mother, I cannot imagine the enormous pain of having to bury your first born child, and as a daughter I can't imagine losing my mother at such a young age. Rather than posting the details of this card, I will simply leave you with a request to say a prayer for my family during this difficult time and to take time to tell the people you love how much they mean to you.